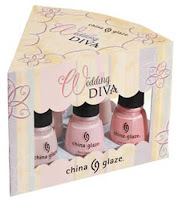 As we said earlier this month, the folks at China Glaze have given us four bride-tastic nail polishes to give away: "Diva Bride", "Cheek to Cheek", "White on White", and "Garter Belt" to one lucky bride-to-be. The winner... chosen by random generator... is the commenter "Giselle"! (Giselle, send us an email so we can get your mailing info.) Congratulations to her! If you didn't win this time, stick around. We have a lot more giveaways coming up in the next few weeks.